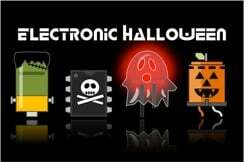 Raspberry Pi powered Halloween Lights and Music Show #ElectronicHalloween « Adafruit Industries – Makers, hackers, artists, designers and engineers! The Magic Mirror has a sonar sensor that detects when kids are are close enough. Then the Magic Mirror says a random phrase before automatically dropping candy to the bucket. The fog and red lights are activated as well. Check out Noel’s instructables profile for more projects here and repurpose this project with an Arduino to use it when christmas rolls around!